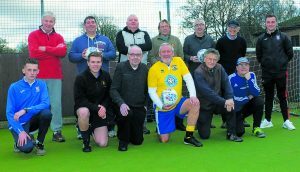 THE organisers were delighted with the numbers who turned up for the first walking football session at Chobham Recreation Ground last Friday. Fourteen people arrived to try out the less-energetic form of the game designed to help keep the over-50s fit and healthy. “It’s a good turnout and we hope the footballers will enjoy the session and keep coming every week,” said Surrey Heath Borough Council community development assistant Craig Alford, who is in charge of the walking football programme. The session began with limbering-up exercises and an explanation of the rules – including no body contact. It was run by Woking Football community coaches Ryan Dent and Bailey Westwood. Hour-long sessions are now being held on the recreation ground’s all-weather pitch at 1pm every Friday, at a cost of £2 per person. Players can just turn up and play and there will be a qualified FA coach for the first eight weeks.